We had a poster for this website, and a viewscope to look at the baby ravens who were about to fledge from a nest on the side of Covel Commons. 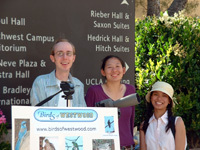 This website serves to raise awareness of and appreciation for the bird life on and around the UCLA campus. 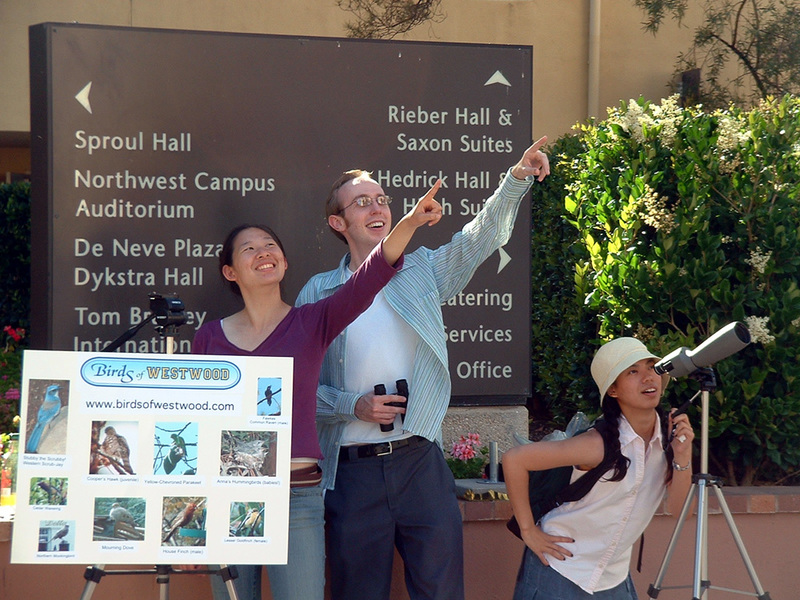 It is geared toward the amateur, the casual birdwatcher, the student who may see a bird on the way to class and wonder at its name.. then perhaps wonder what other birds there may be. I began this way myself. Since finishing my B.S. in Cognitive Science in 2003 I've been working as a researcher in the UCLA Psychology Department. The bit of spare time afforded by no longer taking classes allowed me to start fulfilling a small curiosity I had about some different birds I'd seen on campus. So I began paying attention, and the more I found out about the birds we share our campus with, the more fascinated I became. Soon I was carrying a camera. The thought of making a website occurred early on; I wanted to share that fascination and help others learn what I had. Discovering the birds has added a new level of perception to my experience of life and the world around me. It turned out that I had actually been surrounded by birds, pretty much the whole time, but I just hadn't been looking, hadn't been listening. At least not in the right ways. 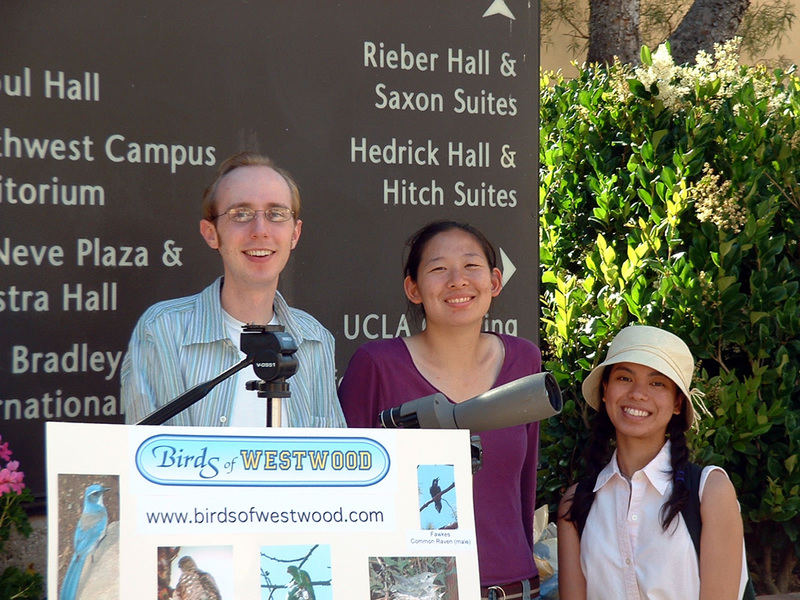 There are many more birds, and different types of birds, here at UCLA than I had ever expected to find. Westwood is something of an oasis of habitat in the city's sea of gray, but there's more to it than that. It seems we tend to think of nature as something "out there," somewhere up in the mountains, in the forests. But no, we are a part of nature, and we are wading right through the middle of it every day. These birds, most of them, they were here first, and they still live amongst us, and we amongst them. We would do well to remember them in our choices and actions, for we are acting on their behalf, and on behalf of the whole living world, of which these birds are only feathered ambassadors. My bold hope is that this website can help others make these same realizations and find the same fascination and joy that I have. At the very least, it should serve as a doorway to new knowledge and awareness of the birds here. Please do return to the site as I have updates and improvements planned, and please don't hesitate to email me with suggestions or questions. My email address is: jrfinley AT uiuc DOT edu (Sorry to have to spell it out that way; I want to avoid getting spammed by programs that scour the web for valid email addresses.) Or go post in the forum! Almost every single one of the photographs on this site was taken in the Westwood area. I've noted the very few exceptions in their captions (e.g. birds like the Brown-headed Cowbird that are so unpredictably seen in Westwood that there's not much hope of getting a picture of them here anytime soon) . All of the photos on this site were either taken by Jason Finley or one of his friends, with explicit credit given in each caption. The sole exception is the picture of the Red-Tailed Hawks on the Fox Theater tower, which was taken by a Daily Bruin photographer and reused with permission. Each and every photograph is copyright the photographer, and may not be reproduced without permission (except under the guidelines of Fair Use). At any rate, if you want to use any of the photos for anything (beside just saving them to your desktop or whatever) please email me: jrfinley AT uiuc DOT edu . The entire contents of illustrations and text from "Birds of the Campus" by Loye Miller is now in the public domain, so anyone can do anything with it without getting permission from anybody. Professors Dan Blumstein, Hartmut Walter, and Tyson Sacco. Graduate student Alex Kirschel. Undergradaute students Bobby Walsh, Joy Sun, and Sean Hoppes. 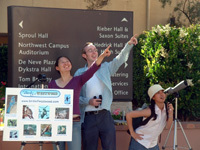 The UCLA Botanical Garden staff. Richard Metzler at Merrihew's Sunset Gardens nursery for providing the "Birds of the Campus" book by Loye H. Miiller and the picture of him. Dan Fink for technical help. And my sister, Breanna Finley, for letting me borrow her telephoto zoom lens. When not properly maintained, hummingbird feeders can KILL hummingbirds. I'm not exagerrating. Please read this important hummingbird feeder information. First off: birdwatching is called "birding." Birding! I think that's kind of cute. Anyway, below are some basics about birds and birding that ought to help you out. The Cornell Lab of Ornithology's All About Birds website also has a great beginner's guide on How to Identify Birds. Also, don't miss Whatbird.com, an excellent site with several methods to help you identify birds you've seen with as little or as much information as you have. Finally, I highly recommend for beginners the book, "Sibley's Birding Basics" by David Allen Sibley. The best time to see birds is in the morning. That's when the most birds are out and about. Hey, this could be the one upside to those awful 8am and 9am classes! Birds are much more scarce in the middle of the day, but do come out again in the late afternoon, although not nearly as much as in the early morning. Pull out the iPod earbuds, get off the cell phone, and start paying attention to what you hear around you. Hear a bird chirping? Calling? Squawking? Go and find out who it is. Now you know what kind of bird makes that noise! The sounds birds make can help you find them to see them, and also to determine what kind of bird they are once you start to learn who sounds like what. Also note that many birds make more than one kind of noise. Many will have a "call" which might just be a "chirp" or "peep" they do over and over, and a "song" which is more like a little tune or ditty. Just looking around, and up, and listening for birds, you'll be able to see many you likely never noticed even while walking between buildings. These will mostly be the more common ones. Keep looking casually and you'll eventually see some more uncommon ones just by chance. But you can also set out to intentionally see some birds! For some of the more uncommon/rare ones, you'll have to go to specific locations (see the MAP page), or stake out a location and sit still for a while to wait and see which birds come out. You should be aware that the same bird can appear to have a highly variable shape. First off, birds can look very different when seen from different angles. For example: looking straight up at a bird perched above you versus looking across at a bird at eye level. Also, birds can puff up their feathers and make themselves look a lot fatter than they really are. Birds in flight often look different from perched birds too. For the most part, birds only build and use nests for breeding, and breeding only happens in the Spring/Summer season. So birds don't regularly go sleep in nests at night, as cute as that'd be. They can actually sleep just fine perching on a branch or something, and usually even prefer to sleep perching on one foot! (Here's a cool article on how birds sleep.) Nests are only for eggs and baby birds. We do have a number of birds that nest on and near campus, but you'll only see active nests during Spring/Summer. In some species of birds, the males and females look very different. In almost all such cases, the males have the more remarkable plumage (feathers). So two birds that don't look much like each other may in fact be the same species! I've tried to get pictures of the sexually dimorphic birds we have. At the very least, you can read the description section for a species to see if the sexes look different. Okay, so why? Evolution. (That's pretty much the answer for everything to do with biology [okay, I'm exaggerating somewhat, but still!]) Birds are the POSTER CHILDREN for evolution. It was, after all, the Galapagos finches that did the most to clue Charles Darwin in to the idea of evolution by natural selection. Man Darwin was awesome. Evolution by natural selection explains how we see birds with different shaped beaks, etc... but evolution also works by sexual selection (really, a special case of natural selection). Typically, male birds must compete for female mates. Females choose the males that seem the most healthy. An example: Males may indicate how healthy and hardy they are by something like bright plumage, which may actually make them more visible to predators. So if a male bird can be really conspicuous but sill escape predation, he must be pretty tough and would therefore make for better offspring, so a female will choose him over a less brightly colored bird. This puts selective pressure on brighter and brighter colors, which we eventually see across the whole species, after many many generations. That's my quick rundown; of course there's more to it and I've probably oversimplified, but that should at least give you an idea. Hopefully I didn't say anything flat out wrong either; please let me know if I did. "Birds were flying from continent to continent long before we were. They reached the coldest place on Earth, Antarctica, long before we did. They can survive in the hottest of deserts. Some can remain on the wing for years at a time. They can girdle the globe. Now, we have taken over the earth and the sea and the sky, but with skill and care and knowledge, we can ensure that there is still a place on Earth for birds in all their beauty and variety — if we want to… And surely, we should." – David Attenborough, closing remarks in "The Life of Birds"